According to WebMD (2012), passionflower has been used to treat not only anxiety, but also related problems such as insomnia, stomach upsets, fibromyalgia, pain, and high blood pressure, as well as seizures and asthma. Some evidence suggests that passionflower may be as effective as certain antianxiety medications. For example, Akhondzadeh et al. (2001) found passionflower extract to be at least as effective as oxazepam (and less impairing). However, the study did not have a placebo group, so it’s difficult to determine how much of the change in anxiety was attributable to a placebo effect (people getting better because they believe that a remedy will help them, rather than because of the remedy itself). The University of Maryland Medical Center (2011) reports on the results of two additional studies. One of these studies found that an herbal remedy containing passionflower and other herbs significantly reduced anxiety among 91 study subjects compared to a placebo. However, given that a mix of herbs was used, it’s impossible to determine which herb or herbs did the trick. Another study found that passionflower supplements reduced anxiety before surgery. Unfortunately, there haven’t been any other studies conducted thus far into passionflower’s effectiveness for treating anxiety. There are many anecdotal reports of passionflower working as an anxiety treatment, but more research is required to confirm these effects. How Might Passionflower Reduce Anxiety? According to the University of Maryland Medical Center (2011), scientists believe that passionflower exerts its anti-anxiety effects by increasing the level of gamma aminobutyric acid (GABA) in the brain (there are also GABA supplements available, and there is evidence that GABA can be increased naturally by doing yoga regularly as well). 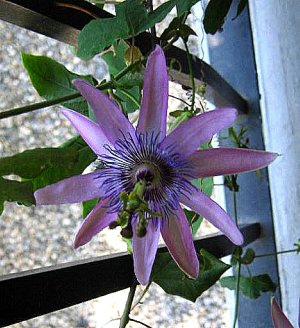 The University of Maryland Medical Center (2011) notes that passionflower’s effects tend to be relatively mild, which suggests that this may be a good complementary treatment for those who want a gentle supplement. However, people suffering from extreme anxiety should consult a doctor and seek more potent treatments such as cognitive-behavioural therapy. Passionflower is available in liquid, tablet, and tea form. Always consult a doctor before using supplements, particularly if giving them to children (there have been no studies conducted into passionflower’s effects on children at the time of this writing). Don’t take passionflower if pregnant or nursing, or within at least two weeks of surgery. Some people who take passionflower suffer side effects such as dizziness or confusion, and passionflower may interact with certain medications. Akhondzadeh, S.; Naghavi, H.R. ; Vazirian, M.; Shayeganpour, A.; Rashidi, H.; & Khani, M. (2001). “Passionflower in the Treatment of Generalized Anxiety: A Pilot Double-Blind Randomized Controlled Trial with Oxazepam.” Journal of Clinical Pharmacy and Therapeutics, 26(5), 369-373. Head, K.A., ND, & Kelly, G.S., ND. (2009). “Nutrients and Botanicals for Treatment of Stress: Adrenal Fatigue, Neurotransmitter Imbalance, Anxiety, and Restless Sleep.” Alternative Medicine Review, 14(2), 116-140). University of Maryland Medical Center. (2013). “Passionflower.” UMM.edu.